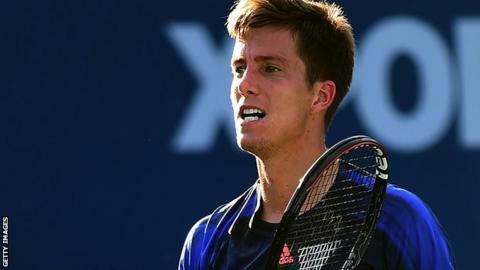 British number two Aljaz Bedene failed to reach the Winston-Salem Open quarter-finals as he was beaten by French qualifier Pierre-Hugues Herbert. Bedene, ranked 82 places higher than the world number 140, lost 6-3 6-0 in the third round in North Carolina. Slovenia-born Bedene, 26, set up the meeting with Herbert, 24, with an impressive win against world number 11 Gilles Simon in the second round. Bedene, 26, now goes on to the US Open, with the draw taking place on Thursday. South African second seed Kevin Anderson reached the Winston-Salem quarter-finals with a 7-6 (7-2) 6-4 win against Poland's Jerzy Janowicz. Third seed Jo-Wilfried Tsonga of France was beaten 6-3 4-6 7-6 (7-4) by American Steve Johnson.